Sunday, May 6, 1888 Mild, but cloudy all day with rain in eve. Leonard poorly, tho' rested very well, & at table as usual. 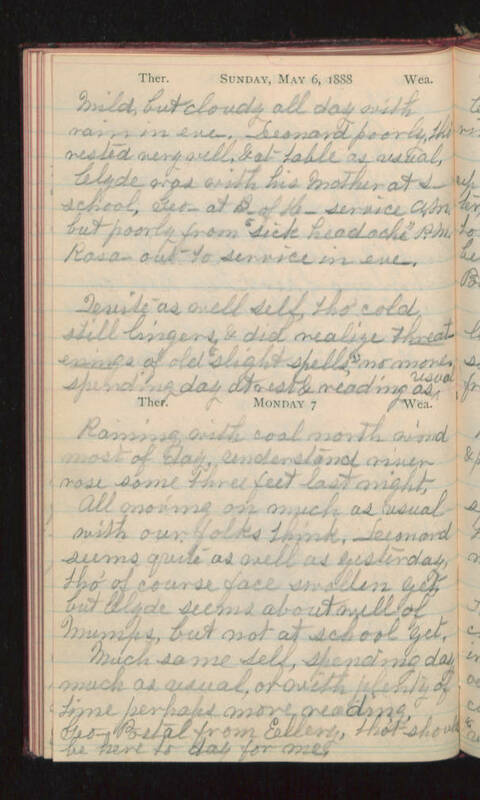 Clyde was with his mother at s-school, Geo- at B of H- service A.M., but poorly from "sick headache" P.M. Rosa- out to service in eve. Quite as well self, tho' cold still lingers, & did realize threatenings of old "slight & spells" no more, spending day at rest & reading as usual. Monday 7 Raining with cool north wind most of day, understand river rose some three feet last night, all moving on much as usual with our folks think. Leonard seems quite as well as yesterday, tho' of course face swollen yet, but Clyde seems about well of mumps, but not at school yet. Much same self, spending day much as usual, or with plenty of time perhaps more reading, Geo- postal from Ellery, that should be here to day for me.